The festival is one of the highlights of the food and drink calendar in Stratford and we’re always delighted to be involved. Before the event itself, you might have heard about us on Touch FM after we welcomed breakfast show presenters Si and Ollie into our kitchen to show them how we put together one of the best champagne breakfasts in town. 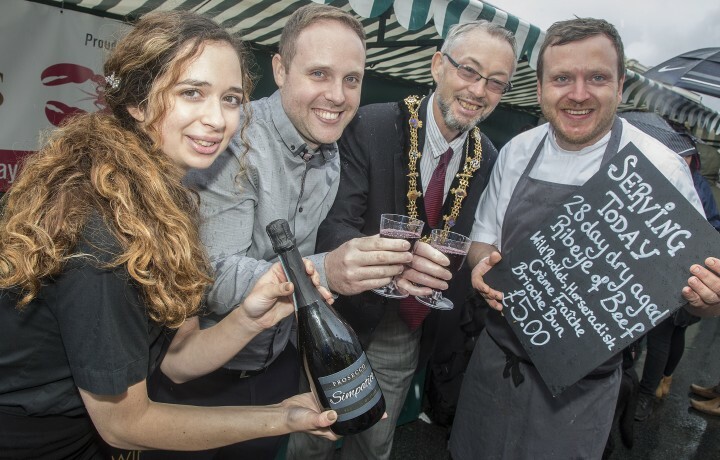 Then on festival weekend itself, our stall on Bridge Street gave people a taste of the Loxleys experience, serving up our delicious roast rib of beef in brioche rolls with horseradish, along with a glass of wine or fizz. Our Loxleys bear marched the streets despite the pouring rain and our very own sous chef Chris provided the grand finale of the festival’s demonstrations on the Sunday, preparing a delightful duck dish for the audience at the cookery theatre. It was great to see the restaurant so busy throughout the whole weekend, with plenty of new faces checking out our brand new look following our refurbishment. The festival gave us the perfect chance to new guests and show them what we offer at Loxleys. We want to extend a huge thanks to our wonderful team of staff who put in a sterling effort across the weekend, to all our customers and friendly faces who swung by to say hi, and to the Stratforward team, without whom the event would simply not have taken place.